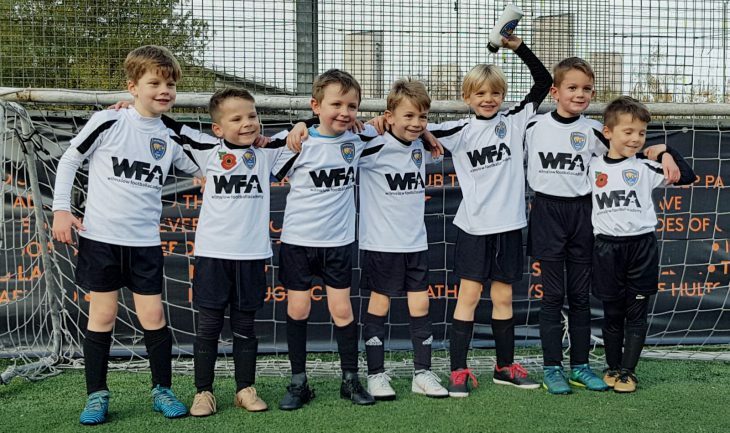 This course is designed for those children in Year 2 who want to enhance their chances of playing in a team and has been designed to develop essential skills. We will focus on the more technical aspects of a young player’s game with the aim of giving U7’s a chance to play for our teams competing in the JJB Tournament. Players will work on movement, range passing, set piece play, turning, running and finishing at pace, as well as marking, losing markers, tracking opponent’s movement and team play. These sessions are run by WFA’s senior coaching staff: Erik, Pete, Will and Nick. Lots of players only train once or maybe twice per week which isn’t nearly enough to fully develop their skills to the maximum. This course will supplement other training sessions and have a positive impact on any player’s performance. an extra determination to work harder. Non JJB players are welcome to join in at either session. Also players are welcome to join in both sessions if they so wish at a cost of £10.